At 7:00 pm, an hour before the film and live performance were set to begin, Kate McQuiston, author of We'll Meet Again: Musical Design in the Films of Stanley Kubrick, took the stage to discuss 2001. She talked of how music was key to the central themes, visual design and meaning of all of the director's films and spoke of how Kubrick edited 2001 around the music he featured in it. She also spoke to the Alex North controversy reporting that Kubrick, at some point, claimed he had never planned to use North's score at all. 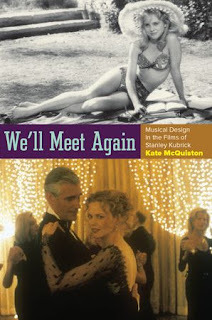 She went on to say that Kubrick also said, in contrast to what most authorities and those involved with the film (including Kubrick himself) have previously reported, that the film's musical selections had never been intended as a temporary music track ("temp track") for the film, that he had always planned to use this music in the finished film. By 8:00 pm the symphony and chorus were in place and conductor Brad Lubman stepped to the podium and raised his baton. Richard Strauss' majestic tone poem Also sprach Zarathustra filled the hall, followed by thunderous applause. And the film began. I hadn't seen Kubrick's space epic in a theater since it was in release in 1968. It was a mind-blower then and it is today. Though its plot has befuddled multitudes over the years, its visual and aural power is riveting. Over the next few hours we were treated to Kubrick's meticulously designed and photographed masterwork with the world-class accompaniment of San Francisco's symphony and chorus. It was goosebump-inducing to listen to the Richard Strauss tone poem, Johann Strauss II's Blue Danube waltz, the Adagio from Khachaturian's Gayane ballet suite, and four avant-garde works by Gyorgy Ligeti. The chorus' performance on Ligeti's compositions was nothing short of a religious experience. Click here for more information on the series and to buy tickets. Many thanks to the San Francisco Symphony for providing tickets to this unforgettable event. Sounds like a glorious experience, Eve. Kubrick definitely combined his knowledge and love of music, along with his background in photography, to create a truly cinematic experience that's not all that dependent on dialogue or even external plot - this kind of movie, at its best, is timeless art. I just recently re-watched "2001" and it more than holds up; it's still revolutionary. It may have been that the studio contracted North's score without Kubrick's checking off on it - whatever the case, the music he selected, combined with the images, is sheer poetry. I know that MGM didn't go around to put Alex North on the project, though it probably did pressure Kubrick to do it. In the end, the right music was chosen. As I mentioned in my post, listening to the SFS Chorus perform Ligeti's work was beyond exhilarating, simply amazing. The whole experience was fantastic.